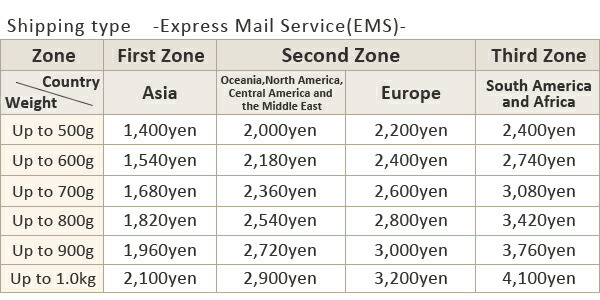 * The shipment to foreign countries will assume it the extra postage by EMS service. * The postage becomes the actual expenses and contacts it in what is different by weight according to the country later. * Appointment, the shipment by the C.O.D. are not possible on the date and time of the delivery date. * About the taxes such as duties by the article purchase, I obey the laws and ordinances of the country to live and have a visitor bear it. * Please confirm size in the exchange returned goods declining any kind of case carefully.we can not accept any return/refund caused by customer's preference. * Please complete your payment procedures after you unify the shipping address registered with shipping address at the time of the order. About the shipping fee, we guide you after dispatch completion from our store. 3)After having guided a rate, I deliver the product immediately. The delivery time is estimated to be approximately 5 business days after shipment.